In the fourth book of their Dog Chronicles series, Alison Hart and Michael G. Montgomery bring readers an exciting tale of friendship and loyalty. Leo, Dog of the Sea, is an action-packed and heartwarming story of a hardened old sea dog who learns that life can be much more than survival. After three ocean voyages, Leo knows not to trust anyone but himself. But when he sets sail with Captain General Ferdinand Magellan on a journey to find a westward route to the Spice Islands, he develops new friendships with Magellan’s scribe, Pigafetta, and Marco, his page. Together, the three of them experience hunger and thirst, storms and doldrums, and mutinies and hostile, violent encounters. Will they ever find a safe passage and reach their destination? This captivating historical fiction chapter book will satisfy any history- or dog-loving reader. Through a dog’s-eye view, children will learn fascinating details about life aboard a ship at a time when much of the ocean had not yet been navigated. Extensive back matter includes information about the historical period and the role of dogs, as well as a bibliography and references for further reading. 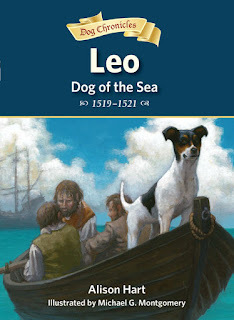 Learn more about Leo, Dog of the Sea in the Discussion Guide and the Author Q&A! Leo, Dog of the Sea is set to dock at most literary ports April 1, so keep a weathered eye open at your local library, indie bookstore, or Barnes & Noble!